Award-winning playwright Mike Bartlett plumbs the depths of Prince Charles’ psyche to give us an imaginary glimpse of the prince as future King of England. The dramedy kicks off with the demise of Queen Elizabeth II and Buckingham Palace’s preparations for a coronation. Bartlett draws from Charles’ past statements, off-handed comments to the press and general knowledge of his public behavior to ponder the question of what sort of ruler this prince will become. Bartlett explores the family dynamic, using the structure and language of a Shakespearean history play while telling the story in Shakespearean blank verse. There is a loose formality to it, yet, it is set in modern day against the backdrop of a rapidly changing society. 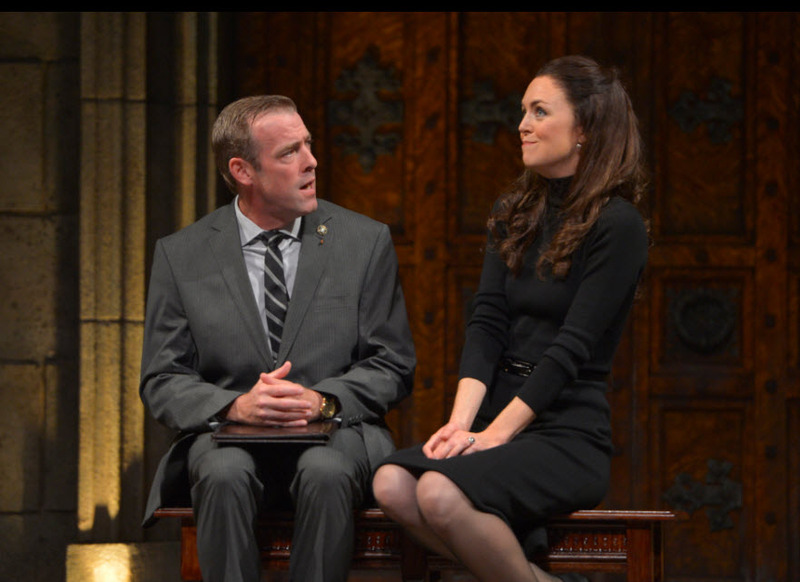 Ian Merrill Peakes as Prime Minister Evans and Allison Jean White as Kate. Photo by Kevin Berne. Among the royal family there is Charles’ stern wife, Camilla (Jeanne Paulsen), the fashionable and super modern Kate (Allison Jean White) and Charles’ two sons – the dutiful Prince William (Christopher McLinden), husband to Kate, and Prince Harry (Harry Smith), the charitable-minded, resident naughty boy. The family’s relationship to Charles, and the bubble they all live in, is scrutinized as is the controversy derived from Charles adverse relationship to his government. As Charles (superbly portrayed by Robert Joy) prepares to take the throne, rumors abound of an uprising among his subjects. The press (Oh, how Britain loves its tabloids!) fans the flames of unrest and riots threaten Charles’ tranquil transition to king. Speculating on how Charles would handle the both the public and the press, is a neat parlor game and Bartlett keeps us guessing throughout the tension. “They all expect me to have an opinion,” bemoans the reluctant Charles, as Harry takes off for a night of clubbing hopeful that the stuffy trappings of royalty will magically disappear from his reluctant shoulders. Pouf! You’re a commoner! 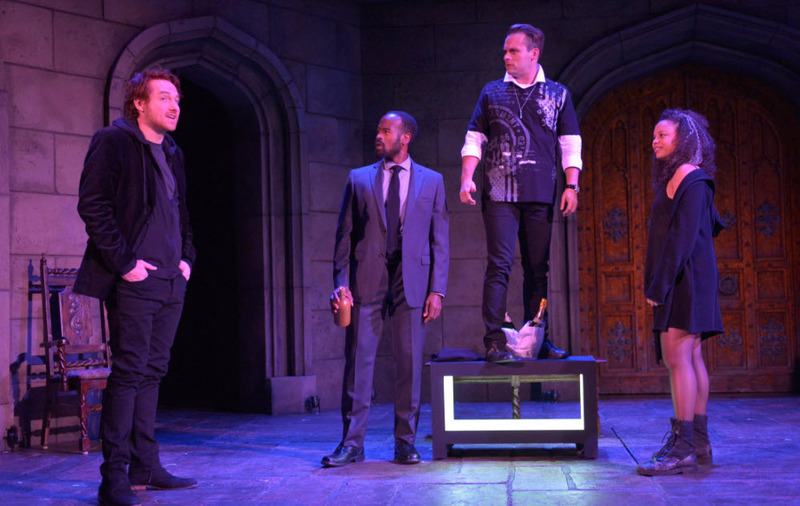 Harry Smith as Prince Harry, Rafael Jordan as Spencer, Jefferson Farber as Cootsy and Michelle Beck as Jessica. Photo by Kevin Berne. When Charles faces his most stubborn critic, Prime Minister Evans (Ian Merrill Peakes), he shows his naiveté in dealing with both Parliament and the press. Uncharacteristically for a ruling monarch, he is determined not to rubber stamp a bill restricting freedom of the press. Though his signature is not required (actually the King has zero power to make policy), it is assumed he will sign whatever is put in front of him. This sets up the adversarial relationship between Charles and his government. His relationship with the Leader of the Opposition Party, Stevens (Bradford Farwell), is also at risk. “We cannot have the King expressing his opinion,” Stevens insists. “It is uncharted territory.” As we all know, Queen Elizabeth NEVER expresses her opinion. It’s just not done. 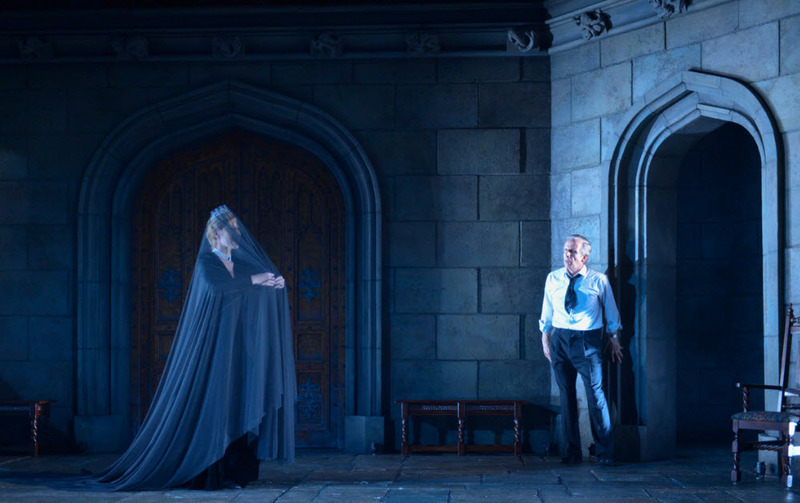 Chiara Motley as Ghost and Robert Joy as King Charles. Photo by Kevin Berne. While Harry credits his new love Jessica (Michelle Beck), an anarchist from the wrong side of town, with “unblinkering” him to the public’s current adverse opinion of the need for the royals, he opens his father’s eyes to the possibility of his unorthodox choice of a mate. Bartlett has a sharp ear for wit and humor and much of the story incorporates Charles’ known idiosyncrasies and his inability to grasp the dramatically shifting mood outside palace walls. Will the high-minded Charles dissolve Parliament on principal, or will he have to capitulate? Will his family support his position notwithstanding the consequences of a monarchy in danger of dissolution? Surprisingly the younger women become the most outspoken change agents. 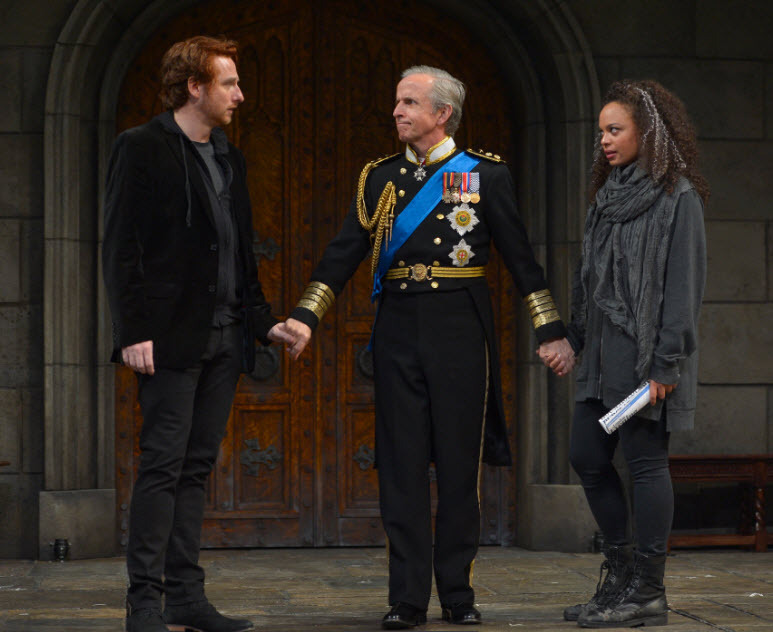 Harry Smith as Prince Harry, Robert Joy as King Charles and Michelle Beck as Jessica. . Photo by Kevin Berne. Co-produced with Seattle Repertory Theatre and San Francisco’s American Conservatory Theater, this five-time Tony Award nominated play is keenly directed by David Muse, Artistic Director of Studio Theatre and former Associate Director at STC. Stunning recreation of the statuary and stained glass windows of Buckingham Palace by Scenic Designer Daniel Ostling with gorgeous heraldic costumes by Designer Jennifer Moeller. Highly recommended for its superior cast and deliciously wicked pokes at the royal family. At the Shakespeare Theatre Company’s Sidney Harman Hall through March 18th at 610 F Street, NW, Washington, DC 20004. For tickets and information call 202 547-1122 or visit www.ShakespeareTheatre.org.